Does my baby ferret need special food? Ferrets of all ages need to have Marshall Premium Ferret Diet and fresh water available at all times. It is important to sufficiently moisten the diet for young ferrets (6-11 weeks of age). • Mix three parts warm fresh water to one part Marshall Premium Ferret Diet (3:1 ratio). • Allow the mixture to sit 3 -5 minutes. • Add more Marshall Premium Ferret Diet or water until it reaches a wet oatmeal consistency. Keep some dry Marshall Premium Ferret Diet available at this age, so your ferret will adjust to a completely dry diet by the time it is 12 – 13 weeks of age. Slowly, convert to dry food only. Marshall Premium Ferret Diet is the food that Marshall Ferrets are raised on and it is highly recommended for maintaining good health. The short answer is yes. If you’re feeding your ferrets a protein-rich diet such as Marshall Premium Ferret Diet, they are getting a majority of the nutrients they need, but it’s always good to use a daily supplement for optimal health and well being. Supplements help maintain a shiny coat and prevent dry skin as well as boosting immunity. High calorie supplements, such as Furo Vite are particularly helpful when a ferret is recovering from illness and needs to gain weight. Ferret nutrition is the most important decision you’ll make for your ferret. As breeders of the best quality ferrets for over 60 years, Marshall knows a ferrets physiological and nutritional needs better than anyone else. Our ultimate goal is to provide the healthiest ferret nutrition available. Ferrets flip over the intense flavor of our Marshall Bandits Premium Ferret Treats. Available in Original Chicken, Meaty Bacon, Raisin, Banana and Peanut Butter Flavors. Bandits are soft and chewy morsels that provide an exciting flavor while still upholding a healthy nutritional value for your pet. Bandits are protein based, making them a healthy choice for you to feed your pet. Used by the world’s largest ferret breeder, Bandits will keep your pet coming back for more. What kind of treats can I give my ferret? We recommend treats that have little or no sugar and are protein-based. Safe and natural treats, such as Bandits treats are a great option and they come in different flavors to appeal to a wide range of tastes. Why are cat foods not recommended? A ferret’s digestive tract is much shorter than a cat’s, which results in rapid food passage. A cat’s digestion is approximately 5 hours, where a ferret’s is closer to 2 hours. Because of this, many cat foods don’t have ample time to break down in a ferrets system and valuable nutrients are lost. Ferrets require high amounts of meat protein and fat. Many ferret and cat diets use meals and grains to substitute for meat-based protein. Ferrets that are fed the Marshall food will normally eat less and receive more nutritional value than other cat and ferret diets. We don’t feed dog food to cats or rabbit food to dogs, so why feed cat food to a ferret? How often should I feed my ferret? Ferrets are considered free-feeding animals, which simply means that they should always have fresh food and water available to them. This is due to the fact that ferrets have an extremely fast metabolism and digest their food every two hours. It also means that they use the litter pan more frequently than other pets, so fresh litter is a must. Why is Marshall Premium Ferret Diet the best for ferrets? Marshall Premium Ferret Diet was developed by a team of veterinarians, nutritionists and experts at Marshall Farms who have been raising ferrets for over 70 years. Results of their definitive testing show that Marshall Premium has proven again and again to be the best food available for ferrets. 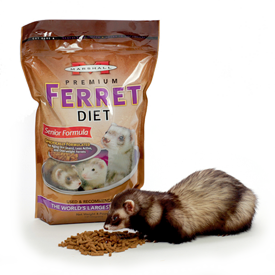 Marshall Premium Ferret Diet is available in 22 oz. cartons, 4 lb. bags, 7 lb. bags, 18 lb. and 35 lb. feeder bags. Our Senior Formula is made specifically for older (4+ years) less active and overweight ferrets. Senior Formula contains 10% less fat and protein than our regular formula to meet the nutritional needs of less active or senior ferrets. See the “Products” section for more details on Marshall Premium Diet, Bandit Treats and more. It is a proven diet. GENERATIONS (thousands) of Marshall Ferrets have been raised on this food. No other diet can make this claim. Contains high levels of FRESH, meat-based protein (38%) for a ferrets active metabolism. It is balanced with a perfect level of natural fat (18%). Unique low temperature, vacuum drying process protects essential amino acids and protein. Most other foods are damaged with high temperature processing thereby making supplementation necessary. Marshall Premium contains natural meat flavors, with no added colors or flavoring. Marshall Premium has no added fat on the pellet surface for consistent nutritional value throughout every food pellet. Marshall Premium is nutritionally complete for all life stages, from kits to adults. Fresh meat, low heat and slow processing allow all of the protein, carbohydrate and fat to present itself in a usable form for the ferret to digest easily and receive maximum nutritional value. What kind of diet is best for my ferret? Ferrets are very different than other domestic animals when it comes to dietary needs. They require a much higher protein diet than a cat, for example. That is why it’s extremely important to feed ferrets food that is specifically formulated for them. Marshall Premium Ferret Diet is the optimal ferret food – high in fresh meat proteins and omega 3s, plus it’s one of the easiest diets for ferrets to digest. Ferrets, especially babies, are susceptible to upper respiratory infections so it is extremely important to shield your ferret from sick humans or other sick pets. Prevention is key, but if your ferret contracts a cold or the flu, you will notice sneezing and you may see a nasal discharge. Cleaning your ferret’s nose is a good step since ferrets have a hard time breathing with URIs. In addition, make sure your ferret is well hydrated – solutions like Duk Soup are particularly helpful and soothing. Your ferret, like a sick child, should start to get better in a few days. If that isn’t the case, you should take him to a veterinarian, because he may need antibiotics. Clipping your ferret’s nails is also a simple, yet important step in keeping your ferret healthy. The best way to do this, is to distract your ferret with a tasty little treat, like rubbing a little bit of Furo Vite or Furo Tone on its tummy so he can lick it while you clip his nails. You may find it easier to have another person helping you. We recommend having a styptic pen or powder on hand to stop bleeding if it occurs. Keeping a ferret’s coat shiny and smooth is relatively simple since ferrets naturally have an oily coat. The key is to not over cleanse your ferret – that could lead to dryness, itching and a dull coat. Realistically, ferrets only need shampooing once a month. Over-bathing strips the coat of essential oils and can actually cause a ferret’s musky odor to increase! Brushing your ferret’s coat is important, not only because it makes the coat brilliant and glossy, but it also aids in the prevention of hairballs by removing loose fur. This is especially important during shedding season. Ferrets do not cough up hairballs like cats and they are prone to getting hairballs; so always keep some Lax or petrolatum on hand to help those hairballs move through their system smoothly. Although we wouldn’t call ferrets a high-maintenance pet, they do require some special care to keep them in tip-top shape. For example, a ferret’s ears are prone to ear-mites and infection, especially in warmer temperatures. They are preventatively treated before they leave our farm. We suggest using Tresaderm. Before using Tresaderm you will need to apply Marshall Ear Cleaner for ferrets to get rid of the wax. Put some of the cleaner in the ear and massage. Let it sit for a minute. The ferret will probably shake his head and the wax will come out. Use a soft cloth to gently clean the rest of the wax out. A ferret’s ear canal is L-shaped so you won’t hit the eardrum, just the vertical part of the canal. After the wax is cleaned out, put the Tresaderm in every day for a week to 10 days. A ferret doesn’t need to go outside to contract ear mites — they can be transmitted from other pets or bedding.If you notice your ferret is scratching his ears a lot or that he has little specks of black “dirt” in his ears, this may be due to ear mites. A vet visit is recommended for a proper diagnosis and treatment. What can I do to alleviate my ferret’s odor? There may not be enough water in their diet – the food should really be wet down (one part food to three parts water). We do not recommend feeding any cat food. Another reason is a bacterial or viral infection that will cause the ferret to have a runny stool and cause them to strain. Besides really wetting down the food, we recommend using an antibiotic (Clavamox, Cefa-Drops or Baytril). This will prevent any infection to the exposed area. Dosage should be .1 ml every 12 hours or as instructed by your veterinarian. Keep the area clean and put on some Preparation H to soothe it. Using Marshall Furo-Vite high-calorie vitamin supplement will help keep the ferret healthy during this period. Green slime, or ECE as it is sometimes referred to, is still somewhat of a mystery. Much is still unknown about how the virus is spread. Any situation that brings ferrets together seems to have the potential for spread of the disease. It may also be transmitted by clothing or human contact. Aggressive treatment should begin at the first signs of green diarrhea. Treat with Pedialyte and an antibiotic (we recommend Clavamox, Cefa-Drops or Baytril) to fight off any secondary infection. Feed a soft diet of moistened Marshall Premium Ferret Diet with chicken baby food, sometimes they have difficulty swallowing due to the formation of ulcers. A high-calorie vitamin supplement such as Marshall Furo-Vite or Ensure is recommended. For persistent diarrhea, or a very ill ferret, use Marshall’s Uncle Jim’s Duk Soup. Take away regular food and substitute Duk Soup. This may have to be force fed via a syringe (use enough water to create a soupy mixture). If the ferret is eating on its own mix the Duk Soup with water, Furo-Vite, Ensure and a little Marshall Premium Ferret Diet. Keeping the ferret hydrated, feeding a soft food diet, and a high-calorie supplement are all very important. Ferrets could develop upper respiratory infections and/or influenza that are related to stress and introduction to a new environment, both of which can be transmitted through human contact. If the ferret is sneezing, pay close attention to the color of mucus and check to see if its eyes are clear. Certain types of litter can cause sneezing. We recommend Marshall Recycled Newspaper Pellet Litter. If the discharge is yellow or green, treat with an antibiotic for the infection (we recommend Clavamox, Cefa-Drops or Baytril). Using Marshall Ferret Rx for congestion along with the antibiotic is an effective treatment. A very wet (soupy consistency) of Marshall Premium Ferret Diet should be given. Mixing in Marshall Furo-Vite high-calorie vitamin supplement is a great way to build up ferret health after stress experienced during shipping. Also make sure to keep the ferret hydrated by adding Pedialyte to the water.